For the latest mini road trip to one of our nearest mountains, I decided to wear my most comfy and practical booties. There I was, all happy and confident about my cute outfit and a few minutes later down the road my boyfriend had to ask "Did you bring your sneakers?" Hello Debbie Downer!!!! En uno de mis últimos mini viajes por carretera a uno de nuestras montañas más cercanas, decidí usar mis botines más cómodos y prácticos en lugar de zapatillas de deporte. Allí estaba yo toda feliz y segura de mi mudada y pocos minutos después mi novio me pregunta "¿No traer sus zapatillas de deporte?" Hola Debbie Downer!!!! That's right!! I didn't need my smelly sneakers, AND I still love the guy since he was only concerned. Así es!! No necesité mis zapatillas tufosas Y todavía adoro a mi novio porque el solo lo hace por preocupación. Booties/Botines: Sam Edelman. Available here and here . 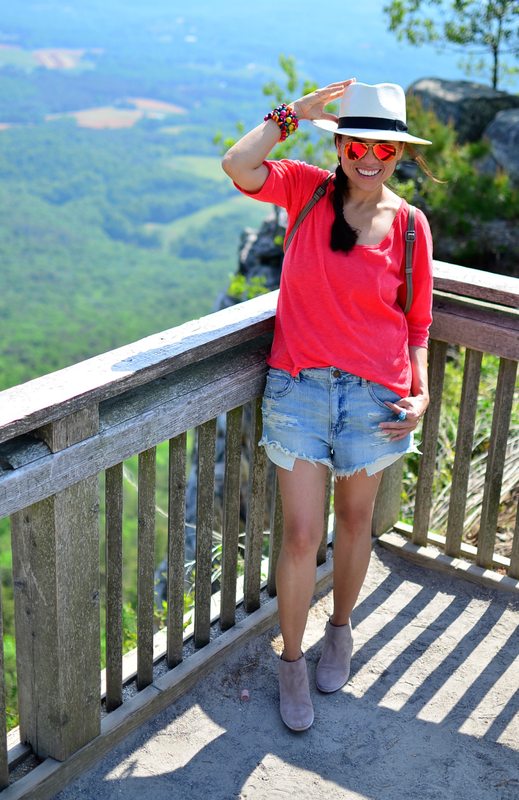 Shorts/Vaqueros cortos: American Eagle. Similar here. Lol..I don't believe you Gina! You can make a sack of potatoes look good. Btw, thanks for compliment, you are so sweet. Thanks Rathana! It really was very comfy. These oversized shorts and booties are the bomb! We only did a mild hike, so this time they worked well. I wish I could wear cute booties instead of sneakers when I run trails or do strenuous hikes. hahaha...your guy is a sweetheart! And so are you! The most stylish person on the trail I daresay! Very cute outfit! He is!!! And I had fun showing off my booties lol. Thanks Sue. Looks so comfy and chic. Beautiful as always!